Springing from your fondest reveries of the Provençal lifestyle, Maison du Village overflows with generously appointed spaces for fun and relaxation, abundant Mediterranean sunshine, and all the cozy comfort and charms of the French countryside. In the heart of old Antibes, savor the restorative beauty of a slower, simpler time while indulging in the luxury and convenience of world-class modern amenities. 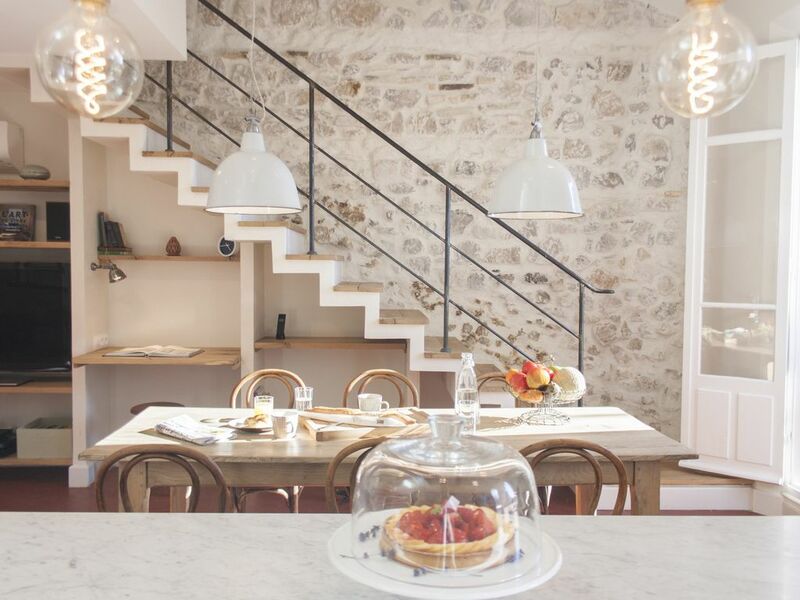 Nestled on a private side street, amid the winding byways of the Old Town, Maison du Village affords guests a quiet escape to a bygone era as well as incredibly easy access to the charming boutiques, cafes, and open-air markets of historic Antibes. With a sun-drenched terrace and three sumptuously appointed bedrooms (each with its own en-suite bathroom), there’s ample room for six guests to enjoy spirited gatherings…or a tranquil space for contemplation. Maison du Village artfully mixes traditional charm with contemporary design sensibilities, in an elegant symphony of hand-selected marble, zelige tilework, and locally sourced French oak. From the meticulously appointed chef’s kitchen, guests can step onto the terrace and delight in the quintessential view over a Côte d’Azur town—warm and sun-splashed hues, patterns of earthen tile and cobble, and those classic red-tiled roofs found in the region. The most vivid imagination could not paint a more picturesque setting! Feel at home and utterly pampered in three en-suite bedrooms, each with its own character and décor befitting the home’s light, bright, and airy ambiance. All bedrooms feature decadent mattresses, linens, and pillows as well as air-conditioner units to ensure truly revitalizing rest for every guest. Entertainment options abound in this sophisticated townhouse, fully equipped with high-speed WiFi. Guests can watch cable TV channels (in French, English, and other languages) on the Samsung LED TV, or pipe into Apple TV and Netflix for movies, TV shows on-demand, and children’s programming. Or, plug into the hi-fi stereo and play your favorite music. Appointed with a convention oven, stove, dishwasher, microwave, Nespresso machine, and refrigerator with ice maker and filtered water, the gourmet kitchen is all ready for your culinary creativity and inspiration. Of course, all the essentials cookware, utensils, dishware, and stemware are included. Share your meal on the gorgeous dining table, or take it outside, to the adjoining terrace. Enjoy a delectable repast and a chilled glass of wine, while looking out on the Old Town. Guests can even cook al fresco, on the gas barbecue grill. Great for a family or a group of friends, this townhouse comes stocked with everything you need for a comfortable stay luxury bath products, a washer and dryer, hair dryer, iron and ironing board, a baby cot and high chair for kids, and even beach towels and beach bags in every room. Each bedroom can be configured to one king-sized bed or two twin beds. Larger groups can also rent the ground-floor apartment, L’Atelier, which accommodates two guests. The Maison du Village allows you to get out from behind the wheel and right into the Provençal pace of life. The ideal location means no driving is necessary to fully explore beautiful Antibes. Museums, restaurants, grocery stores, boutiques, bars, cafes, and naturally the sparkling Mediterranean beaches are all within easy walking distance. In fact, the wonderful Provençal market with its farm-fresh fruits, vegetables, meats, cheeses, flowers, and more is only a two-minute stroll away. Antibes is located 25 minutes from the Nice Airport. The town also a train station (10 minute walk from the house) and a bus network in and around the area. We have a detailed site called Antibes-Rental with suggestions of restaurants and places to visit and things to do. We have set up several holiday rental properties located in Antibes on the Cote d'Azur. We hand-pick unique and beautiful properties in Vieil Antibes, renovate them to exacting standards to provide well-appointed accommodations for our guests. You can see more pictures of the property on www.antibes-rental.com. Antibes-Rental focuses on the medieval village of Antibes for our holiday rental properties as the town has maintained its historic character with charming cobbled-stone streets. Antibes also has beautiful beaches, a famous Provençal farmers market, and fantastic restaurants and cafés. The village is conveniently located 20 minutes from Nice International Airport (Cote d'Azur Airport) and has convenient train access to points throughout the region. Guests do not need a car to enjoy an amazing holiday. Located in the centre of old Antibes--steps away from restaurants, shops, and the Provencale Market. Wonderful natural light as there is no vis-a-vis in front of the building. All of the bathrooms are unique and are fitted with hand-made tiles which enhances the feeling of each space. We have proper showers each bathroom. The largest bathroom (in Chambre Bleue) has a separate bathtub as well as a shower. We also have a separate one bedroom apartment (L'atelier) on the ground floor which accommodates two guests--perfect for larger families or friends traveling together. Check out our website www.antibes-rental for more information. Simply the most perfect place to live ever! So where to begin! I think its very safe to say that we all want to go back now as we had the most amazing time. Maison du Village's description on the site was spot on. In fact it was BETTER in reality than what was written on the site, this is a first for me. It was clean, spacious and had everything you could ever want. We all commented on the fact that this was the best equipped holiday home we had all ever been in. The space was more than enough for us all. The support from Suzanne, Tom & Paul was really good. They seemed as if they were friends allowing you to share their home. Beaches are great in Juan les Pins and the Beach Club in Antibes worked well too. Simply put we want to live there all the time. Thank you for letting us share for a bit the life you have in Antibes. Take care and we all hope to see you again next year. Everything about this apartment was a pleasure. The rooms are spacious, the beds are comfortable, and the living space is charming. The kitchen was well stocked when we arrived, including a lovely bottle of wine, OJ and milk. The owners and their kind representative are easy to communicate with and very responsive. There is a guide book that the owners wrote with helpful reviews about everything in town from restaurants to local specialties. The location is in the heart of Vieux Antibes, just minutes from restaurants, boutiques, the ramparts, the beach, the Provençal market, the Picasso Museum, and yet it’s quiet and so comfortable inside. I hope we get to the opportunity to return someday. We had a wonderful stay at la Maison du Village which is true to its name: a house in the village of Antibes but on quiet pedestrian street. The house itself was beautifully decorated with all the amenities including a Nespresso frother for those cafe lattes and ice dispenser for keeping those bottles of rose chilled! The beds were very comfortable, the rooms bright and airy. The living area is large and practical as it is located next to the dining room and I would recommend using the terrace as it is right off the kitchen. The instructions left on the counter were a useful reference guide and the Antibes guidebook with its suggestions of restaurants, sights and cafes was a wonderful personal touch by the owners. As the street is pedestrian and as such, not accessible by car, we parked in the underground parking right in front of the post office and while not the least expensive choice, it was very practical and only a minute away from the house. To note, as everything is close by and easily accessible by walking (grocery, bakery, pharmacy, etc.) the only time we did use the car was for those excursions to other sites (ie. Village of Eze). The owners (Tom) and the property manager (Suzanne) were both quick to respond to all inquiries before and during the stay. The pictures are exactly like the house although the living room is actually larger than the picture depicts. All in all, a lovely home that allows one to experience the village life. I had the pleasure of staying at the house over the new year with my wife and four kids. Upon entering the house we realized that it was the finest house in Antibes. We were a party of six and there was ample room for all of us. The interior and design of the house is world class as it is the classic style of the house. We loved every minute of it and look forward to going back soon. The management is efficient and extremely polite. Can't wait to go back, it was the best holiday we have had for years. Renting from Antibes-Rental made our stay so much more than we expected. The locate,on in the old part of town on a quiet street, was well situated for shopping, sightseeing and the beaches. Tom and Paul thoughtfully provided everything you would need in a beautifully decorated comfortable space. They also had prepared a written guide to the area with information about places to visit and restaurants recommendations with their personal insights from living in the area. Tom and Paul are more than a rental agency. They care about the comfort of their guests. Friends of ours highly recommended we work with them. We are very glad we did and we urge you to seriously consider doing so also. We look forward to renting from them in the future. Maison du Village provides the perfect setting to enjoy the quaint cobbled streets, casual cafés and glamorous beaches of the French Rivera. Plage de la Gravette is located five minutes from the house. Antibes also boasts several private beaches with casual restaurants and beach chairs. We recommend Royal Beach on Salis Beach. Visitors should also explore the larger beaches at Juan Les Pins, on the opposite side of the Cap d'Antibes, as well as its many restaurants and speciality shops. Antibes is well-known for its Provençal market. Socca, olives, cheeses, flowers, sausages, jams, seafood, and fresh fruits, meats, and seafood are among some of the regional specialties on offer. Visitors should also check out the cathedral and the old ramparts of Antibes and the famous Picasso Museum. Antibes' Train station is a ten-minute walk from the house and provides access to places such as Cannes, St. Tropez, Nice, Monte Carlo, Eze, Menton, Marseilles, etc. The rate includes all taxes and expenses and cleaning at the end of the stay for one-week or less. For guests staying longer than one week, we include weekly cleaning and change of bed linens at no extra charge. We provide L'Occitane soap, shampoo, conditioner, and body lotion for each bathroom. We require a 50% deposit to secure bookings and the remaining 50% + 600 Euro for a security deposit to be settled 4 weeks prior to arrival. We offer credit card payment through Homeaway's payment system but charge a processing fee of 3% for the rental.